If uncollected rubbish dumps, lack of running clean water and a dilapidating infrastructure inspire you Julius, then I suppose you should relocate to Harare. Greetings to you Julius. I am sure you will note that this is my second letter to you on the same subject matter. I understand that you visited my country Zimbabwe recently, and that you continue to be inspired by how ZANU (PF) has decimated our economy and its potential. Well, Julius, I dare say that your standards are obviously not that high and I forgive you for that. You see, this is the case with most black Africans; all you have to do is look throughout Africa to realise that the black man, left to his own devices, has dismally failed to raise his standard of living despite having all the resources he needs. Your country, South Africa, is currently suffering from the same disorder and events in the Limpopo province, where you come from, certainly do not inspire me. Shouldn't you be rather spending your energy there to get things right? There are historical reasons for that I think, the main one being that coming from poverty backgrounds, black Africans do not really demand or expect much from their leaders. You see Julius; there is just something about us black people and our standards. They are just so low and your inspiration from the Zimbabwe situation proves that to me. By the way, Julius, I forgot to ask you whether you had electricity at the wedding you attended because on that day, I didn't. If stinking uncollected rubbish dumps, lack of clean running water and a dilapidating infrastructure inspire you Julius, then I suppose you should relocate to Harare. I have a perfect spot for you where you can, once again, get inspired using pit latrines as some of you do now in a developed South Africa. I understand that this is also the case in Limpopo, where some infrastructure is in bad shape even after some black owned companies were paid to do the work to repair it. I am sure you are aware of that. That hardly inspires me Julius. I am an enthusiastic believer in economic transformation and the ownership of our economies by the majority and not by international monopolies and oligopolies who are to me, the new colonialists. On that point I fully agree with you. However, that does mean that I should accept a substandard life style. I don't know about you Julius, but I note that you aspire to live in Sandton (the taxman willing) and not in Thembisa as most of your brothers and sisters do (not that there is anything wrong with living in Thembisa). I don't know whether you are aware that Zimbabwe does not actually control its mineral wealth? These have been dished out to the Chinese and to ZANU (PF) cronies some of who are reported to be now building mansions there in Durban. We don't even know where our diamond revenue is going Julius, can you believe that? I guess that inspires you Julius. You no doubt, will also be inspired by our agricultural revolution (as you would call it), where now we cannot even feed ourselves and must import maize from Zambia. 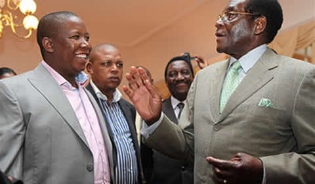 Yes Julius we in Zimbabwe now "own" those farms but they are useless and lying idle. Julius, in Zimbabwe, we even own closed factories and shops, we own our own airline which is grounded, we own all our state enterprises that are facing closure because of mismanagement, we own steel mills, power stations, railways, mines; hell you name it Julius and we own it. But all that we own is either underutilised, in a state of disrepair or being driven to the ground through corruption or mismanagement. That's inspirational Julius, isn't it? My advice to you Julius, is to use this "sabbatical" that the ANC has forced upon you wisely, and study and improve yourself. You do have some good arguments on how we must begin to ameliorate the condition of black Africans. You however, need to sharpen your thinking skills. Africa needs future leaders who are educated, principled, who have integrity and are sensitive to the dynamics of the environment that they operate in. If you by any chance aspire to be one of those, good luck, but I can tell you that will not get that from coming to Harare to insult our intelligence. You seem to have a unique gift of persistently doing that. Julius, economic freedom in this lifetime is possible, but only if we insist on high standards of leadership and delivery. Nationalisation will not achieve that economic freedom, nor will violence, greed and corruption. Fighting for higher wages is like a slave, fighting for a daily tea break; it will not fundamentally change the economic relationships in South Africa. I shall be in touch with you again soon, and we may perhaps sit down and inspire each other on the need to develop both our countries and come up with new economic models. Let us rather spend our energies on that, don't you agree? Finally I encourage you to choose your friends wisely Julius, because the tide is turning and true economic freedom is coming soon to Zimbabwe. Real economic freedom Julius, which you might want to be once again inspired by. "all you have to do is look throughout Africa to realise that the black man, left to his own devices, has dismally failed to raise his standard of living despite having all the resources he needs." POPPYCOCK When the white man was boss, he lived in a mansion whilst us farm workers lived in mud huts on the same property. Its the white mans standards that will be the death of us. History shows us that whenever the white man tries to impose his standards on people of culture they die. They bring in their diseases corruption and greed. They are Evil in its purest form. leave us black people alone with our low standards to poop in our pit latrines. How many black people get to enjoy these five star lodges. drive a fancy land-rover. As a guide you make a five star meal serve it to your boss and of they go sleep in their comfy beds, then you go back to your mud hut and cook your sadza and veggies and maybe if your boss is nice you might get some bones and fat to add to your veggies, over an open fire. We are thief's and savages and yet we cook and look after their babies and children. But hey i guess even God has an angle with low ranks to do his laundry. ZIMBABWE ---A hand full of British die in the land struggle = CRIPPLE THE COUNTRY WITH SUCTIONS. SYRIA ---- Over 7000 people die (non white) = No sanctions or anything i mean who cares..
got along just fine and the country was doing fine. How many British colonies are thriving you ask? The locals of these countries were not forceably removed from their fertile land and put into reserves were they could not farm or make a living, the only way they could survive was to work for British or thousands killed in the invasion. DID THEY?? i mean you cant erase this history a great injustice was done.. Lets find a way to move forward.